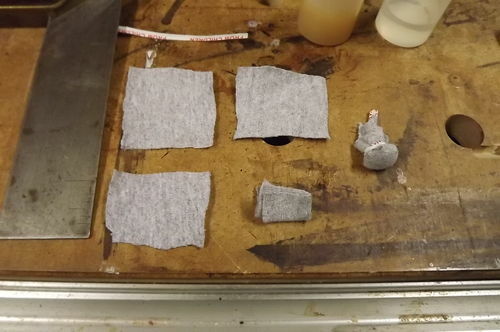 Here we go with a simple method to French Polishing materials Cut material to your liking I find that these small swatch of material work great. Two piece padding one fit inside the other once folded and tied with a twist tie or rubber band. Next the product…. 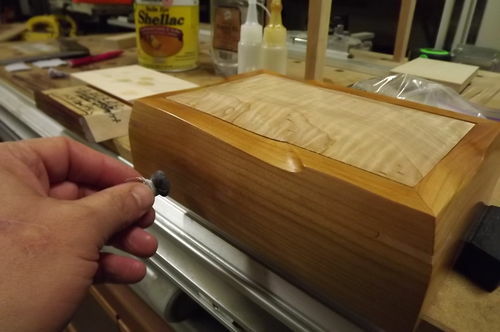 Store bought Shellac and as my lubricant mineral oil…I find that these small plastic dispenser work great at delivering droplet at a time to charge the pad, one or two drops per load of shellac works great. 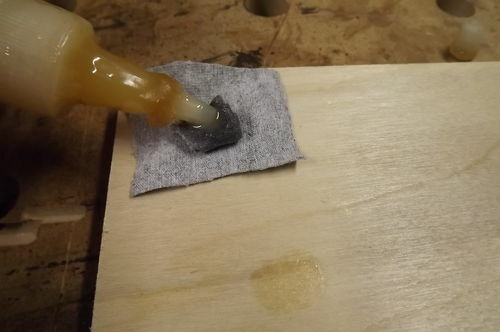 When making the pad the inside folded pad get a nice dose of shellac wet it well then fold then add one or two drop to the exterior side and pounce the pad flat. Now light tap the pad with a droplet of oil. 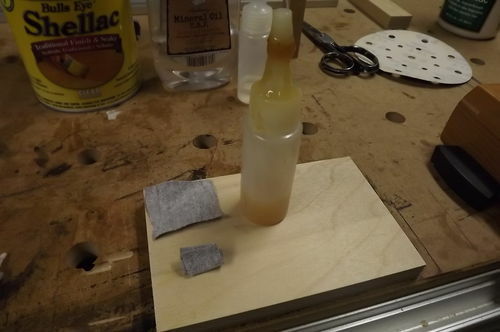 Now when using the lubricate use very little and only use oil once the pad starts to drag, practice on a small scrap piece as to get the feel when to re-lube. 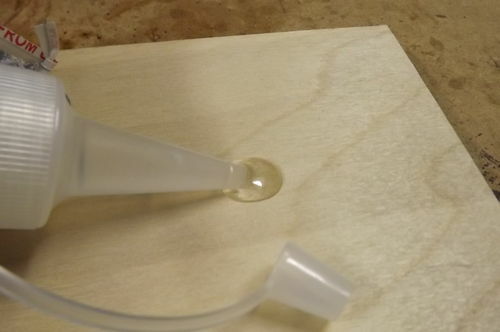 Adding to much oil will cloudy up the finish so use sparingly…Now were ready to start the finishing process. 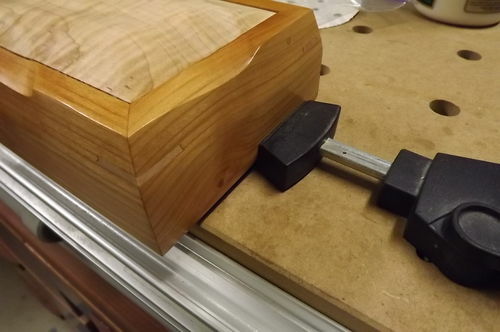 First clamp the work piece on to a bench and only work on two sides at a time then rotate work piece ie box or such. Start by using a end to end motion straight across end to end rapid motion the pad should glide across work piece. In the example piece above I start off by going end to end about five coats as soon as I reach the end of the piece go right ahead and begin another coat this stuff dries that fast like lighting…after 5 to 10 coats start to alternate cirular motion with the end to end action…Fellas that the jest of this simple methods its not rocket science but the result will take your project to a new level of finishing. Now Shellac produces a wonderful finish but its not the most durable so for those project that are more for show than durability French polish is wonderful. 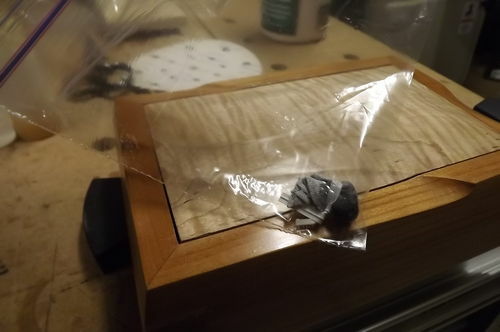 Great for accent piece and boxes best of luck on your polish hope you’ll give it a try …your friend in woodworking Blackcherry Great way to store your pad if you have to leave the shop for a few hours is to place it in a air tight container like this zip lock bag. I store my pads in a mason jar. I shoot some alcohol in on top of the pad to keep them moist between used. The outer pad covering should have the largest string count that you can get. Just don’t cut up your wife’s 1000 count sheets. I found that course count abrades the layers of shellac that have been already been laid. If you want to see that occur, use some denim material and you see troughs cut in the lower layers. 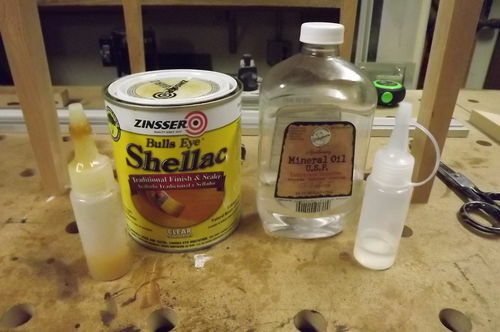 Another thing that I’ve found useful is to spray shellac to get a build up faster. 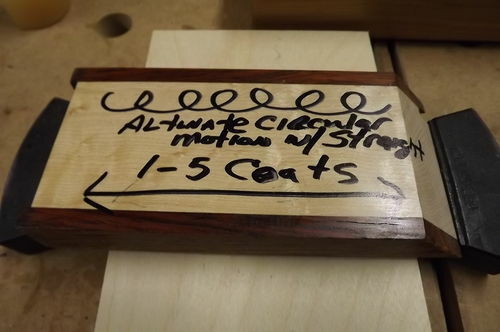 When I made my daughters cradle I used sprayed Amber shell on the curly cherry and tiger maple to get any and all pores filled. I then sanded with 600 grit and baby oil to level the surface that then did the french polish to build up to the shine. Thanks BC. I gotta try this. We all appreciate you taking the time to do this blog for all of us. The pics are just what I had pictured from our PM conversations. The pad seemed tiny when I made it but I think a big one would cause problems. Can’t wait to do my next one! You have made finishing fun for me. Thanks for sharing the knowledge!!! I know that I will be trying this on a few projects. Now to get the shop setup, so as to make those projects….. I just shellaced something the other day and really liked it. I need to use it more. Does it matter what kind of cloth you use? Looks good, French polish looks like its worth trying.